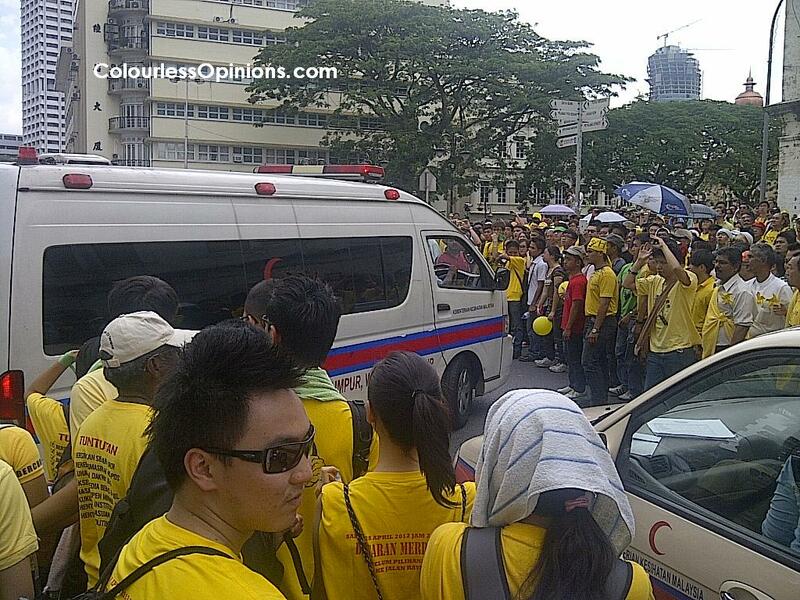 Unlike Bersih 2.0 that I’ve experienced last July, the police were not intimidating at all at the beginning. We were free to wear yellow and take the LRT to where we want. After hearing rumours that some LRT stations may have been closed, my friends and I had to take the Pasar Seni stop and surprisingly, there was already a massive crowd there all around the area from Central Market to Kota Raya to Jalan Sultan. It was only like 10:30am, majority were in yellow, and no unreasonable actions taken by the police unlike the previous occasion. The people were, of course, of all ethnicity including Caucasians, and of all adult ages. From my rough estimation, I’d say probably a quarter were senior citizens. We had our meals at McDonald’s, that was overcrowded and was eventually closed up. 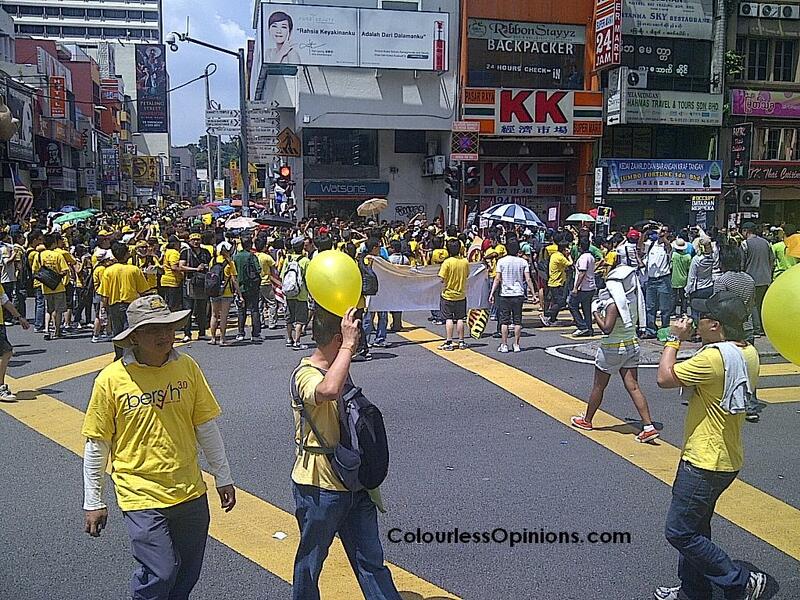 We walked onto Jalan Sultan at around 12pm and the rally seemed to have begun. Majority joined in while some just continue standing around because the official kickoff time stated on Bersih official website for all meeting point except KLCC was 1.30pm. But we just joined in anyway. Bumped into “Auntie Bersih” Annie along the way. The numbers were pretty amazing for only one out of six sides that are headed towards Dataran Merdeka, the sit-in protest’s destination. Whatever numbers the mainstream media tells you later, it’s definitely a few times more. 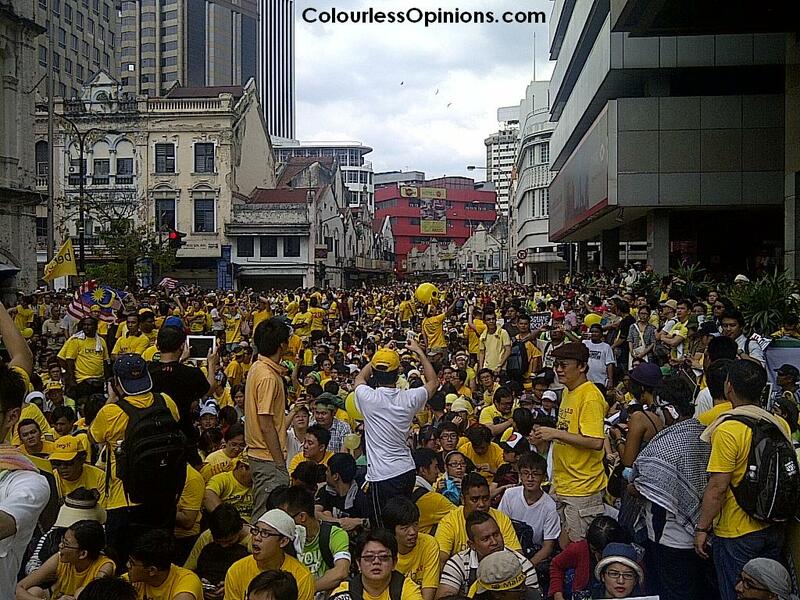 They said only 5,000 attended the previous Bersih but from what most people could see was that it was at least 20, 000. No idea why but this rally that we followed walked all the way in, took a big round just to come back out from Jalan Tun HS Lee, and then moved toward Dataran Merdeka. It was a long and slow march in the very very hot weather. If there was cocktail, it would’ve felt like some big beach carnival with yellow as the theme colour. I had my mum cut off the sleeves of my t-shirt but I guess it didn’t really help that much with the heat. It was quite relaxed and totally not as intense as the last time. We sang and we chanted about the cause and nothing political. There was even a large yellow beach balls being passed around in the air like a big concert. It was right before 2pm when we reached to the location, which was the bridge at Leboh Pasar Besar road that leads to Dataran Merdeka where the police had already barricaded with barbed wires, we just sat. We tried to ask the police open up and let us in but to no avail. They were in line with shields and probably weapons, prepared to stop us from crossing no matter what. And so we just followed the rally leader’s instruction and just sit down. 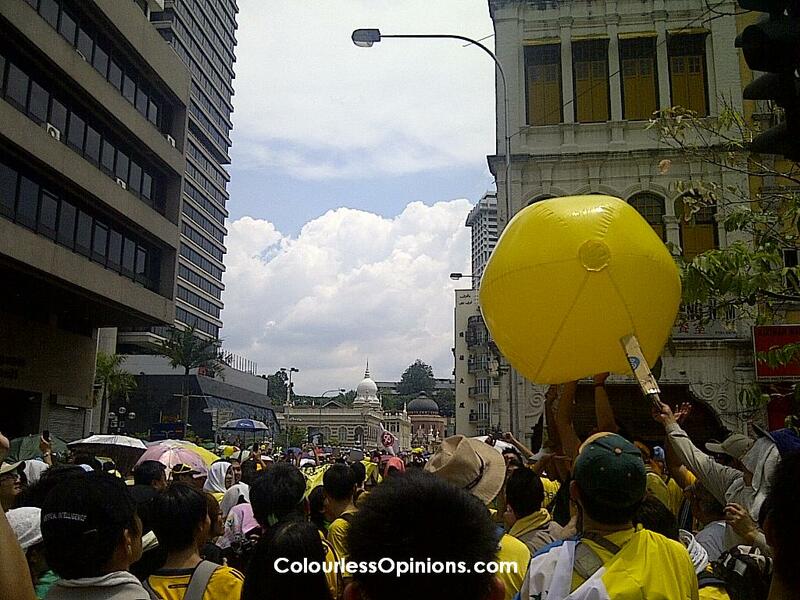 Dato’ S. Ambiga, the chairperson and organiser of Bersih, had already made it clear on the prior day that our objective was to sit around the destination and crossing over would mean that you went against the rules set by DBKL. An ambulance came squeezing through the packed crowd with its emergency siren on, hoping to cross the bridge to get to the hospital. Before we reach here, we actually saw someone seemingly unconscious on the ground surrounded with people who were trying to help. This person may had been in that ambulance but guess what? The ambulance weren’t allowed to go through the barricades either and was forced to make a three-point turn in the packed crowd of protesters. Another ambulance came later on had to make a U-turn as well. So the riot police force‘s front line was far away from the barricades and our front line was just busy taking pictures. Nothing was happening. We were sitting there for almost an hour with no phone or internet coverage, without knowing what’s going on around. Taking photos was the only activity besides chanting and singing. Many couldn’t stand the heat and ended up walking around looking for a roof instead of staying at where we were supposed to. We had no idea what’s going on at the other sides, thanks to our incompetent telecommunication providers, and our patience was put to the test. We made a move when someone started walking around telling everyone to go to Jalan Tun Perak. Just as we walked farther away from the barricades, the riot police seemed to have came in closer with their trucks. We ignored that and just moved away from that area and went towards Jalan Tun Perak while looking for a shop to get some water. Even 7-11 was closed. One of the mamaks near by was opened and we took the chance to refresh ourselves with some drinks. The queue for packets of ice was incredibly long. 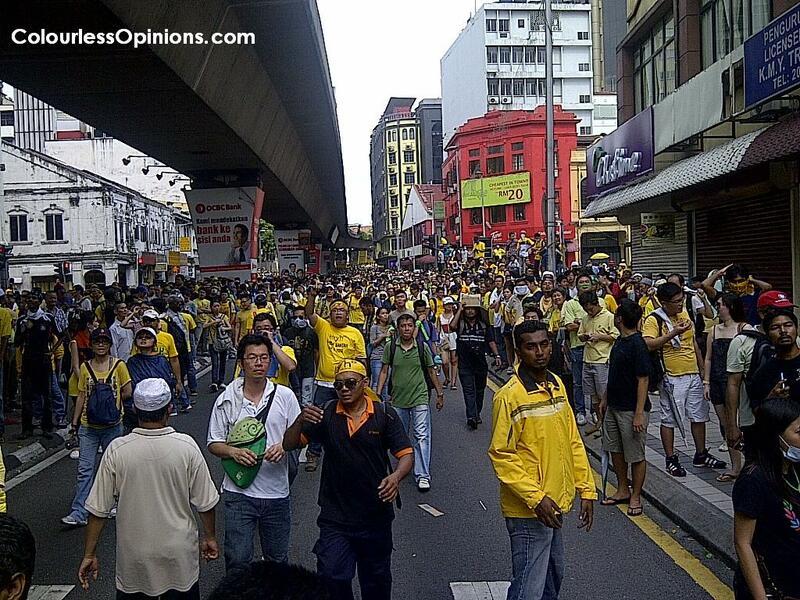 And so we got to Jalan Tun Perak at around 3pm and that’s where it started getting a little chaotic. Initially, tear gas canisters were fired for the front line protesters to move back. I didn’t actually see any provocation. I only see protesters standing around peacefully. And then, for unknown reasons, tear gas canisters were fired over and over again by the police. A little too much, I felt. There was even one that fell right in the path that I was running. They were no strangers to me so they didn’t bother me as much as the last time. Many participants were going around giving out salt and water to everyone to neutralise the effects of the tear gas. Those who passed out because of the heat or teargas had the care of the people around and the medics. Many got angry because of the excessive use of teargas and started kicking garbage bins, resulting a rubbish-filled road. But one small group of young female participants were going around cleaning up the mess. 3.50pm, the end time of the event was near, we wanted to make a last stand but was received by tear gas. Then after 4pm, we just stood far away from the barricades and just witness the demonstrators in front getting fed with more tear gas and water cannons from the police force. Determined to stick to the original agenda and disperse after the end time, we tried to look for way to head home but all the LRT stations around were closed. It’s quite funny considering that the purpose of the PDRM was for us to disperse and yet the most convenient public transport stopped their service. As we walked back to Kota Raya, the wind blew the tear gas from another road to where we were. We took the public bus to get out of Kuala Lumpur. Even in the bus we still see the police firing tear gas. I pity the innocent lorry drivers with windows opened. Now this was all that I saw and gone through at this side of the demonstration. I witnessed no violence from either side besides water bottles being thrown at police patrol vehicles, and tear gas canisters & water cannons fired to the protesters by the authorities. 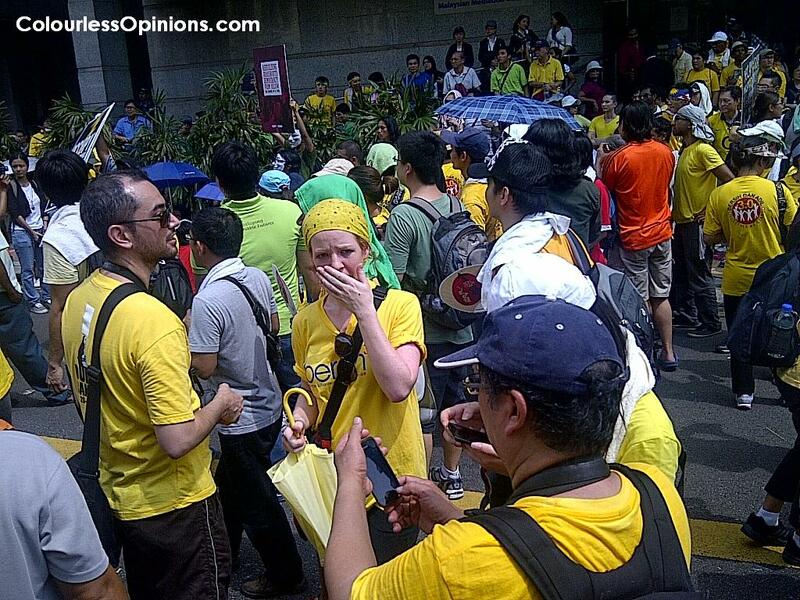 Participants of all races were just as caring to one another as the previous Bersih. What happened at the other locations (the rally that went from Masjid Jamek, Masjid India, Pasar Seni, Central Market, KLCC, etc) is another story for someone else to tell. I have, however, already read a lot about the terrible things that happened there and seen many pictures and videos that are circulating around Twitter and Facebook. My aftermath thoughts are shared on this entry. The tens of thousands, including my friends and myself, took part of Bersih 3.0 because we agree that the coming general election will be the dirtiest ever, we support free and fair elections, we want genuine democracy, and we wish to exercise our rights as the citizens of Malaysia. Before Bersih 2.0, not many people I know bothered about the issues and now, to know that some of these people actually attended this time or at least cared about the cause, makes me feel extremely proud and delightful. 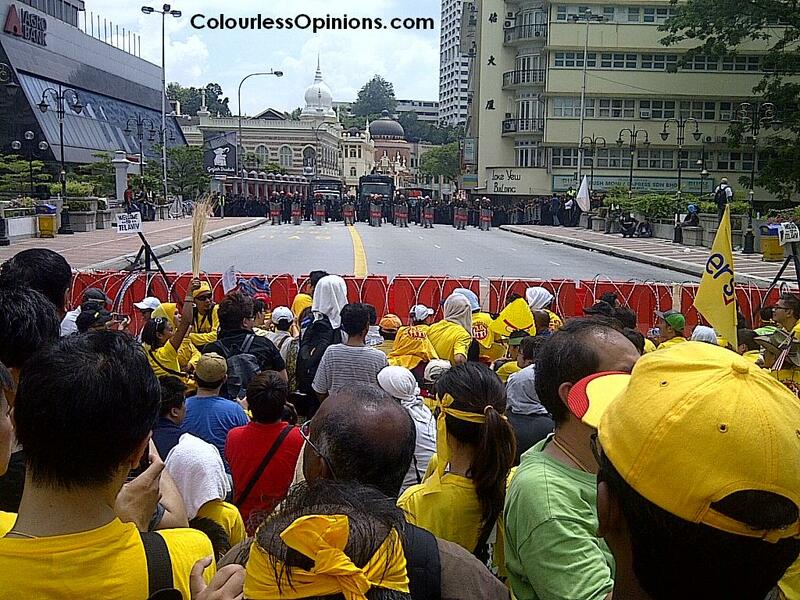 Marina Mahathir that went into the front line said that those are not barbered wires, those are razors wires. From a facebook source, it was said that the government request the telco provider to jam their service in the area, hence not connections for u all. Thanks for telling us ur experience, I suppose u will be one of the spectator that can proof the water canon and canisters were fired b4 the rally break through the barrier? 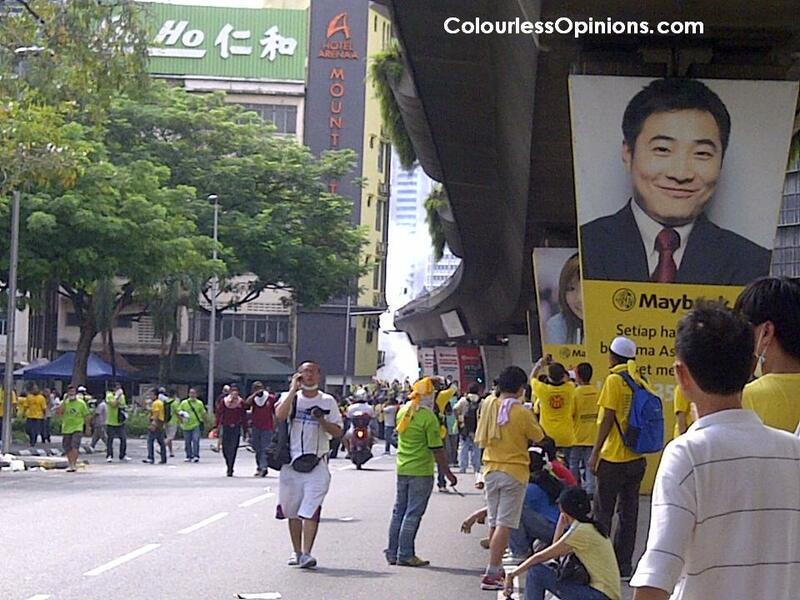 I don't know about you, I support Bersih for a clean and fair election, not for any political parties. If the next party governs the country and has dirty election again, and we shall "bersih-kan" them too! reason why we couldn't access internet and make calls…. There is so much reports and mostly rather bias in some way. As much as to be said that this event do not hold political interests, political interferences inevitably follows gatherings as such. When there are conflicts as such, things becomes complicated. Let us all support the event for a better future. Thank you for sharing your thoughts as a spectator present at the rally. We need clean elections. Too much screw ups and strangely the PM demands we give evidence that elections has been unfair. Grrrr. 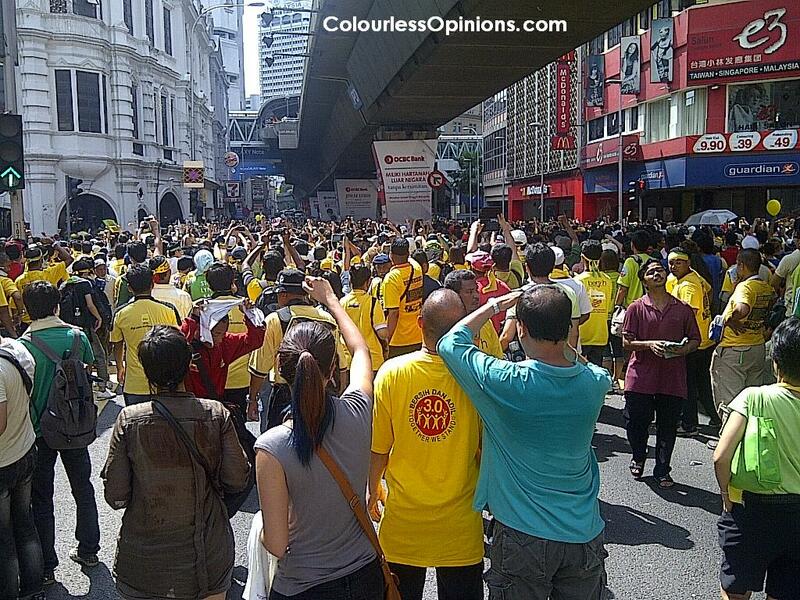 Bersih once again shows that the citizens irregardless of race will not tolerate nonsense from the ruling government. Love the muhibah feel. Project Ic is all true as Foreigners are freely given Citizenship by the ruling BN Government..!! u know, it is sad that bloody govt. simply give the permission to foreign worker and tell them vote for "them". Kind of sacarsm for me. and no clean election. I dare govt. please launch the GST right now! So we will see who will won election at the bloddy ending. 1.当一个和尚、初出道 (小学生)，在修行, 若有缺点, 那是难免.他马华公会鹅唛區会主地席叶金福律师(Yip Kum Fook)，却心眼看不顺，就电招警万到耒佛教之圣地要扣畄和尚耒耻唇出家人, 这是绝对不许可, 除非是殺人放火之大罪悪. 2.他身为马华公会鹅唛區会主席叶金福律师 (Yip Kum Fook)，却反其道而行, 在佛寺不依佛法而軽视佛教的精神, 以傲慢的手段，帶领一般黑社会的人耒挑衅和尚打架, 这也是不该有、更不是佛教修行者的行为. 囯有囯章，彿有佛法，家有家规. 如果出家人有何不对之处, 他叶金福律师 (Yip Kum Fook), 为何不向主持和尚投？让出家人自依和尚的條规处理、却强权一味要显示他是马华公会鹅唛区会及三宝寺理事会主席, 无法无天的应用霸道手段践踏佛教之圣地.为什么。。。。。为什么. 在此, 我奉劝, 他马华公会鹅唛区会主席叶金福律师 (Yip Kum Fook), 好自为之, 免因果報应. In September last year, four directors of Pembangunan Perlancongan Nasional Sdn Bhd (Pempena) Datuk Yip Kum Fook (MCA GOMBAK, who is BAD name in Buddhist) Datuk Donald Lim Siang Chai, Syed Abdul Rahman and Jaigani Jaafar – were served with letters of demand for payment of more than RM12.4 million owed by the company. The letters from lawyer Joginder Singh, who was acting for Kah Bintang Auto Sdn Bhd were sent by registered post. On receiving the letter, one of them, Lim, the former deputy toursim minister and current deputy finance minister, contacted the CEO of Pempena and asked him to act on the demand. For a good eight months, nothing happened. No effort was made to contact the motor company or negotiate a settlement. Failing to get a response, Kah Bintang published notice of an intended winding up petition in two national newspapers on May 28. The petition was set to be heard on June 13. At the hearing, the petition was undefended as neither Pempena nor its lawyers made an appearance. The court allowed the petition and asked that Pempena be given another 14 days to pay up. On June 27, that short lease of life for the company expired and Pempena ceased to exist. Yesterday, akin to closing the stable door after the horses have bolted, Malaysian Tourism Board chairman Datuk Victor Wee announced that Pempena would be applying for a stay of the winding up order this week. The decision, he said, was made after a meeting with the management of Pempena last Friday. A new solicitor will be appointed to apply for a stay and work out an amicable settlement. He was responding to theSun’s front page report which said the High Court had ordered the company to be wound up after failing to pay RM12.4 million for the purchase of 120 units of Hyundai Sonata. So, the questions are: “Why did the Pempena CEO ignore the letters, and the call from Lim who was then a director of the company? Was it incompetency or sheer arrogance or total defiance of a lawful directive? Why did Pempena not act after the notice was published? More importantly, where is Pempena going to find RM13 million (including interests and costs) to pay the motor company? Why should it come from the tourism promotion budget when all fingers point to the directors, who by virtue of their positions should be held responsible for this fiasco? There’s no benefit in keeping Pempena afloat as it has not contributed in anyway to enhance tourism and related products. In short, it has been bleeding financially and has become a burden to Tourism Malaysia. The best option is to dispose the assets, settle the debts and close shop so that it does not lose more money. Throwing good money after bad does not make good business sense. Ven. Ashin Indaka asked money Rm400 from devotees who want to become a monk at SAMNAK SAMBODHI, TAMAN DESA JAYA, KEPONG, KUALA LUMPUR. This is making Buddha shameful or make ugly to Buddhist people whole world. If he did it and he must leave from his Buddha’s yellow robes. We requirement to Ven. Ashin Indaka consider to resign from his position of Buddhist monk, other while, Buddhist can gossip or chitchat by the other religion.